Get your summer pots and baskets off to a good start with our mix. We’ve hand-picked the perfect combination of flowers to give you eye-catching displays this summer. Plant them up in your pots and baskets and fast track to a colourful garden with no fuss - look like a design pro! Easy to grow - just plant them up, water them and enjoy the display! Quick and easy - the ideal solution to give you pots and containers full of colour. Guaranteed to give you a fabulous display all summer, 'Parma Violet' collection plugs are supplied as a mix of 12 plugs of Verbena, Lobelia and Petunia. Just imagine, the perfect way to achieve stunning baskets and containers this summer, with minimal effort on your part! We’ve hand-picked the ideal combination of flowers to give you eye-catching displays this year that will be the envy of your neighbourhood! If you've wanted perfect pots and creative containers full of colour, but don't know where to start when it comes to picking complementary plants, then our Parma Violet plug collection is the best solution for time-strapped gardeners. Plant them up in your pots and baskets and you'll soon be enjoying a colourful garden with no fuss - you'll look like a design pro! Quick to plant and easy to grow, this collection is the ideal way to give you pots and containers full of colour - just plant them up, water them and enjoy the display! Guaranteed to give you a fabulous display all summer, 'Parma Violet' collection plugs are supplied as a mix of 12 plugs of Verbena Samira White, Lobelia Laura Purple and Petunia Pegasus Purple Vein. Verbena adds a little touch of the exotic with trailing fragrant foliage and clusters of white star-shaped blooms. Flowering from June to October their mounds of flowers help fill out the whole arrangement. 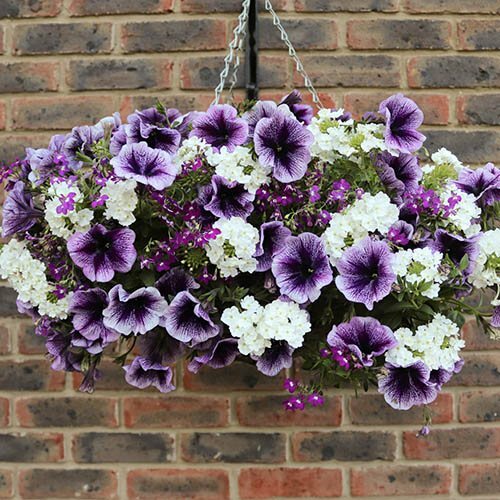 Lobelia is the iconic hanging basket plant, producing masses of tiny purple flowers. Fast growing, it quickly fills a large space in any basket! Petunias always make a statement in summer arrangements and their fragrance is unmistakable as you pass by. With their glorious purple, velvet trumpets, they're an absolute must-have, blooming from May through to October! Supplied as 12 jumbo plug plants in a mixture of Verbena, Lobelia and Petunia.